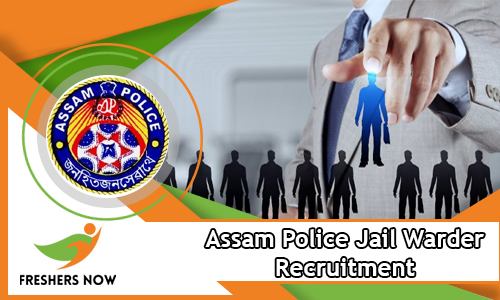 Check complete details regarding Assam Police Jail Warder Recruitment 2018-2019 Notification through this article. So, aspirants who are willing to apply for the recent notification Assam Police can check out this whole post. The Assam Police Department has released the notification from 8th April 2018 to hire aspirants who have good skill tests. Also, aspirants have to apply for the recruitment before the last date, ie., 8th May 2018. Therefore, we suggest the aspirants apply for the Assam Police Jail Warder Recruitment 2018 before the last date. Moreover, the higher officials reject the aspirant’s application if they submit after the last date. Candidates can also check eligibility criteria, educational qualifications, age limit, selection process, pay scale, and details about how to apply for the notification. In addition to this, also refer to, Assam police 2018, Assam police recruitment 2018, Assam police job 2018. Contenders who are willing to work with Assam Police Department can go through this article. The Assam Police Department is recruiting the aspirants for 135 Vacancies who are talented. Moreover, we are also providing the candidates with the links at the bottom of the article. So, by clicking on these links aspirants can download the Assam Police Jail Warder Recruitment 2018-2019 Notification. Also, from the below sections check the details about age limit, educational qualification, and a lot more important stuff regarding Assam Police Jail Warder Recruitment 2018. Furthermore, the aspirants can repeatedly keep visiting this article for more latest updates regarding the exam dates of written test. Also, the selection process here is unique. Moreover, you can also check the additional details from the upcoming sections. Therefore, candidates visit the official website of Assam Police Department @ assampolice.gov.in. So, from the above table, aspirants can check the effective information regarding the Assam Police Jail Warder Recruitment 2018-2019 Notification. Moreover, you can also get the important details of the name of the company, the number of vacancies, the number of posts, starting date to apply, closing date to apply. Furthermore, the mode of application is online. Also, aspirants who are worrying about the queries regarding the recruitment can check the official web portal of Assam Police Department @ assampolice.gov.in. Moreover, to apply quickly contenders can check the active and quick links present in the beneath sections.Furthermore, for more recent updates we suggest the candidates keep visiting our article. Also, you can check the post wise vacancies from the upcoming sections. Moreover, we are helping you out with detail manner of steps to apply for the recruitment. Are you looking for the Assam Police Jail Warder Recruitment 2018-2019 Notification? Then you are at the right place. Contenders whoever are willing to apply for the notification can check this article. Moreover, go through the links at the bottom of the article. Also, download the notification for free of cost only through this article. Furthermore, contenders can apply through the links that we are providing. As soon as, you click on the links you can redirect to the official website of Assam Police Department @ assampolice.gov.in. In addition to this, aspirants whoever are dreaming to work in the field of Police can apply for this notification before the last date that is on 8th May 2018. Also, before applying for any notification aspirants have to check for the application fee. And, the to check the application fee refer to the notification pdf below. In addition to this, aspirants should also check the age limit. The age limit is the main criteria for all the aspirants for which they have to refer to. Also, every candidate has to cross check the information about the selection process, educational qualifications, age limit, age relaxation, application fee details, application form, etc. Furthermore, to qualify the exam and attain the dream job aspirants can download the Syllabus and Previous Question Papers to achieve your goals easily. Aspirants age limit should be minimum of 18 Years and maximum of 35 Years. And, the educational qualification is HLSC or its equivalent degree from recognized college or university. Moreover, aspirants can check the important dates of the notification from the upcoming sections. Also, we suggest the aspirants stick to the article completely. Female Warders: Must have passed annual education of VIII Standard in the school recognized by the government. Regarding the application fee candidates can refer the official notification that we are providing in the upcoming sections. The pay scale of Assam Police Jail Warder varies with the experience and way of work. As per the official notification, the minimum pay scale is 14000/- to 49000/-. And, the grade pay is 5000/-. Visit the official website of Assam Police Department @ assampolice.gov.in. Search for the link Assam Police Jail Warder Recruitment 2018-2019 Notification. Now click on the particular link. Mandatorily check the eligibility criteria. Upload the necessary details present in the official notification. Pay the application fee through Net Banking/Debit Card/Credit Card.